From the Bride... "It was a Friday night after work", says Jennifer Dodson, who met Nahil Bayrasli in Midtown Manhattan seven years earlier. "I got to his apartment and there he was with flowers and the ring. We celebrated with dinner and then called our families." They're both in financial services and have very busy work schedules. "The thought of planning a wedding was overwhelming to us. We needed a planner who could help us find the right vendors and handle all the negotiations." Jen researched and interviewed about 10 planners. "A lot of them were with large companies. I felt they would cover the bases, but in those large companies, I didn't feel they were as invested in me and my vision. "When i met Jackie at Busy Bride, I felt we had a lot in common. We come from similar backgrounds and I liked that she had been in a career previously but left because she felt so passionate about what she does now. I thought she was also very flexible and well-priced. "Once we picked the Rainbow Room as our venue, we felt strongly about keeping a budget and Jackie was very good at helping us stay on track. She also responded promptly to all my emails and calls. Sometimes I would wake up in a panic in the middle of the night with a nightmare about the wedding and send her an email and she would respond by 5 am. She went above and beyond. "If you want a planner", says Jen, "look for someone who fits your personality. It's also important to know what you need from your planner. I needed someone to be organized for me. Jackie was able to keep everything on track." Having your planner there on the day of your wedding is also key. "The day of, Jackie and her team were absolutely amazing. I could not have asked for the day to go better." Reflecting on the best advice she got to her wedding, Jen says, "It's your wedding, so focus on what is most important to you and also take time throughout the day to be in the moment. From the Wedding Planner... "To help Jen and Nahil have the perfect wedding day" says Jackie Travers of Busy Bride Planning + Consulting, "I had to create and execute a seamless, stress-free wedding day timeline and assist in securing the perfect team of vendors to fit their vision and budget." Jackie tells us that successful wedding planning depends on, "attention to detail and organization, clear communication between vendors and the couple, and most importantly, putting together the best team of wedding vendors." Jen and Nahil wanted their pre-ceremony photos at iconic locations around New York City, such as Central Park, Bryant Park, Grand Central, and Rockefeller Plaza. "The United Nations General Assembly was in town and New York was faced with numerous street closures and traffic delays. With only a few hours for the photo shoot, a perfectly planned timeline was crucial to the day's success." The couple also wanted a non-stop dance party and assistance in executing some of their personal touches. Jackie recommended starting their entertainment search with Hank Lane Music. Jen and Nahil hired the Bobby Atliko Band and were not disappointed. "The party did not stop!". To incorporate the groom's Turkish background, they asked the band to mix in Turkish dance sets - "the crowd went wild!". Jen and Nahil added other personal touches to their wedding, such as black and white cookie favors from their favorite bakery, Melita Bakery in the Bronx, and pizza for their after-party, delivered from their favorite Brooklyn pizzeria, Enzo's Pizza. Busy Bride does not accept referral fees. "That gives our couples an extra level of confidence in our recommendations", says Jackie, who has been a planner for as long as she can remember. Growing up, she created detailed itineraries for family vacations, reunions, and birthday parties for her family, friends, and neighbours. "Even after a detour to law school, I naturally veered toward planning and joined a Manhattan law firm where I advised clients on estate planning". But it wasn't until she began planning her own wedding that she realized her obsession with all things wedding. "I enjoyed negotiating to obtain the best prices. I delighted in researching every detail and preparing a timeline and master plan to bring it all together. 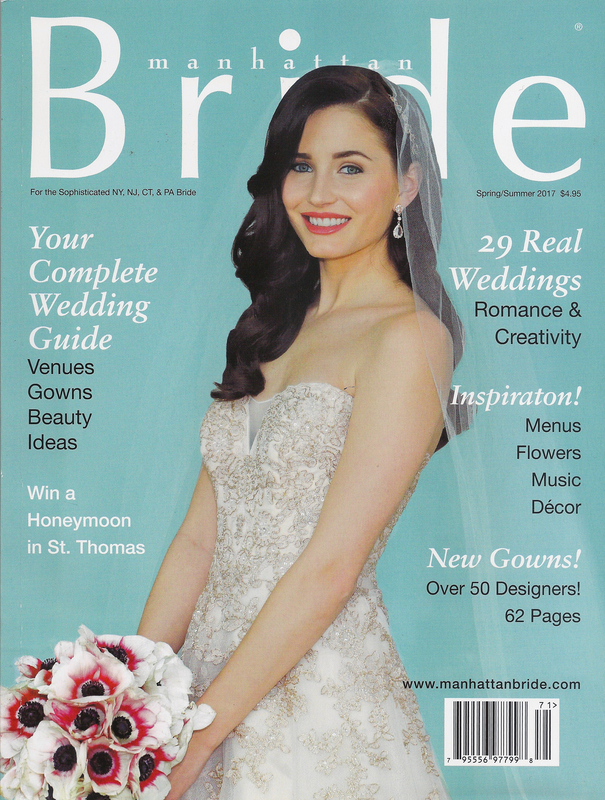 "In the end, I planned my own fairy tale wedding that I was honored to have featured in Manhattan Bride magazine. In sharing my intrest in weddings with recently engaged couples, I realized that i had a skill - one that I had been developing for many years. After three years of practicing law, I decided to turn my passion for wedding planning into a full-time career and Busy Bride Planning + Consulting was born ! "Helping couples plan their weddings is extremely rewarding, and I work tirelessly to ensure that enthusiasm is reflected in every event I have the privilege of orchestrating. After months of pletely wrapped up in the joy of their celebration." CEREMONY & RECEPTION: Bourne Manison. Lauryn and I met while working together at a BBQ resturant called Blue Smoke in NYC. She was the hostess and I was the server/bartender. We were good friends for a few years before I asked her out. For our first date, we enjoyed music and mimosas in Tompkins Square Park. Two years later, I asked her father, her stepfather, and her uncle for their blessing to propose to her and they gladly approved. I took Lauryn back to Tompkins Square Park and proposed, with our photographer friend Chelsea hiding in the bushes to capture the moment! My father, Michael Lessing Sr., is the president of Lessing's Hospitality, which operates several catering venues, including Bourne Mansion. In my summers home from college, I bartended at Bourne Mansion and I always loved the classic layout, grand rooms, and timeless feel of the manison. Since Lauryn and I both work in the resturant business, food and service were important to us and I knew Bourne Mansion had delicious food and an extraordinary wait staff. We worked closely with my father Michael and with Steve Melita, the general manager, and they ensured we got the best of the best. We were married at a nearby church. During the ceremony, my friend Sergio spoke and Lauryn's uncle read a prayer. Our cocktail hour had a Great South Bay clam and oyster bar, a sushi station, an antipasto station. We had several passed hors d'oeuvres, including favorites like the pesto and goat cheese tartlets, watermelon and feta pyramids, tomato and basil bruschetta, and phyllo wrapped asparagus. The craft beer tasting station was also a big hit! To highlight the grand luxurious feeling of the ballroom, we had simple, elegant decor. The room was lit with a pink up-lighting and the tables had alternating high and low centerpieces filled with white and blush flowers. Our band was incredible and so talented. They had a wonderful female lead singer and another great male rapper. The band created great energy that had everyone dancing all night. Dinner began with a warm goat cheese salad accompanied by fingerling potatoes and duck prosciutto. For the main course, we offered a duet meal of grilled filet mignon and jumbo shrimp in a cabernet sauvignon sauce. In addition to our delicious wedding cake, we had an elaborate Viennese Hour with all the works. It included a chocolate fountain, Italian pastries, chocolate chip cookies, cupcakes, and everything you could think of. Later, at our after-party, we offered late night snacks including a hot pretzel grill and French fries. Our guests were thrilled when a Mister Softee truck pulled up outside Bourne Mansion and served various ice creams!